This article was originally written for the New Zealand Fishing News September 2010 edition. A hectic July saw the Hokianga Accord participating in the development of six major submissions that have been sent to the Ministry of Fisheries. These documents were in response to proposals for the future management of seaweeds, trevally, hapuku, scallops, the deemed value regime and importantly kahawai. As the mid north iwi fisheries forum the Accord is working hard with our customary, amateur and environmental Alliance colleagues to collectively achieve ‘more fish in the water’ for our mokopuna [descendants]. 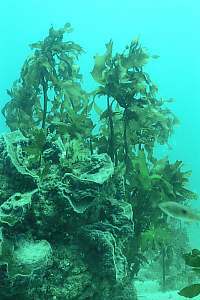 Despite our earlier protests, southern stocks of attached bladder kelp seaweed are being introduced into the quota management system on 1 October. In response to multiple concerns, MFish proposed to implement five fine-scale management measures for southern seaweed. Together with option4 and NZ Sport Fishing we proposed a sixth action - we urged the Minister, Phil Heatley, to act conservatively so the environment can sustain itself and future generations of New Zealanders. Next, we submitted in response to the proposals for Trevally 2 (Hawke Bay to Wellington) and Hapuku Bass 3 (East Coast South Island). While these fisheries may be miles away from the north there are fundamental principles that are not being upheld in these, and other, important inshore fisheries. Excessive commercial fishing has depleted many fish stocks to such low levels that non-commercial fishers in these regions can no longer provide for their social, economic and cultural well-being. Both Maori and non-Maori are suffering. All three management proposals for both Trevally and Hapuku were rejected in favour of a fourth option, to decrease commercial catch levels so the fisheries can recover. We wait in anticipation that the Minister will listen to our concerns. Annual surveys are conducted to estimate numbers of scallops in the Coromandel fishery, which extends from Little Barrier to Papamoa Beach, Bay of Plenty. Survey results are analysed and generally lead to proposals to increase commercial catch limits. Potential in-season increases always attract strong opinions. As in previous years the scallop beds are healthier around Mercury and Great Barrier Islands, but particularly poor around Waiheke, Waihi and Papamoa/Motiti. We submitted that no extra commercial catch ought to be taken out of these three areas. Once again the Accord has contributed comments on the deemed value regime. There is no excuse for the Crown to be reaping financial rewards because commercial fishers are exceeding the legal catch limits. We have strongly advised the Minister that all overcatch from one year ought to be taken off next year’s total allowable commercial catch (TACC). For example, if there is 10 percent overcatch in 2009 then in 2010 the overall commercial catch limit for that fishery ought to be 90 percent of the TACC. This is the only fair system that takes into account the excessive amounts of fish being taken out of the water, and essentially from the mouths of our babes. Kahawai is a taonga [treasure] and one of the very few fish that used to be caught relatively easily from the rocks, rivermouth or beach. Now many of our mokopuna have grown up without knowing what a kahawai looks like. emphasises that our social, economic and cultural well-being will only be met when these mighty fish are once again plentiful around our coastline.